The only major U.S. railroad to be operated by westerners and the only railroad built from west to east, the Southern Pacific acquired a unique history and character. It also acquired a reputation, especially in California, as a railroad that people loved to hate. This magisterial history tells the full story of the Southern Pacific for the first time, shattering myths about the company that have prevailed to this day. 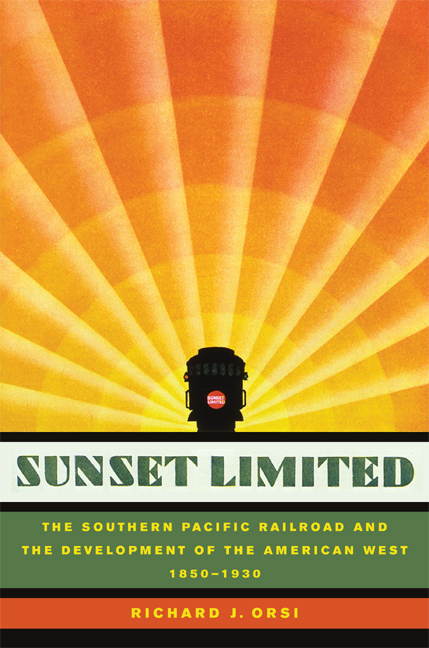 A landmark account, Sunset Limited explores the railroad's development and influence—especially as it affected land settlement, agriculture, water policy, and the environment—and offers a new perspective on the tremendous, often surprising, role the company played in shaping the American West. Based on his unprecedented and extensive research into the company's historical archives, Richard Orsi finds that, contrary to conventional understanding, the Southern Pacific Company identified its corporate well-being with population growth and social and economic development in the railroad's hinterland. As he traces the complex and shifting intersections between corporate and public interest, Orsi documents the railroad's little-known promotion of land distribution, small-scale farming, scientific agriculture, and less wasteful environmental practices and policies—including water conservation and wilderness and recreational parklands preservation. Meticulously researched, lucidly written, and judiciously balanced, Sunset Limited opens a new window onto the American West in a crucial phase of its development and will forever change our perceptions of one of the largest and most important western corporations in the late nineteenth and early twentieth centuries. Richard Orsi is Professor Emeritus of History at California State University, Hayward, coauthor of The Elusive Eden: A New History of California (third edition, 2002), and editor of the California History Sesquicentennial Series.